We’d love your help. Let us know what’s wrong with this preview of N. N. Light's Book of Daily Inspiration by N.N. Light. 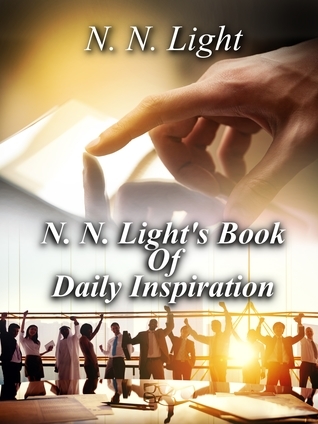 To ask other readers questions about N. N. Light's Book of Daily Inspiration, please sign up. As 2017 came to a close, I wanted to read a non-fiction book that would help me focus on potential goals and plans for the upcoming new year. Given I write a 365 Daily Challenge blog, it only made sense that I find a book where there were 365 daily messages for me to ponder; that's when I stumbled upon this book from a blogger I've followed for most of the last year: N. N. Light’s Book of Daily Inspiration by N.N. Light. I thoroughly enjoyed this collection of inspirational advice, quotes and ref As 2017 came to a close, I wanted to read a non-fiction book that would help me focus on potential goals and plans for the upcoming new year. Given I write a 365 Daily Challenge blog, it only made sense that I find a book where there were 365 daily messages for me to ponder; that's when I stumbled upon this book from a blogger I've followed for most of the last year: N. N. Light’s Book of Daily Inspiration by N.N. Light. I thoroughly enjoyed this collection of inspirational advice, quotes and reflection. I would recommend it to anyone, and I'll even tell you now, I plan to re-read it (something I rarely do) again in 2018... perhaps 1 month at a time, soaking up each set of inspirational messages. Books like these can be tough. Everyone can say 'RahRah' to help motivate you (is that the proper way to spell 'RahRah' -- eh, sounds good! ), but it can get old quickly if the messages aren't lyrically written or vast in their range of advice and inspiration. The husband and wife writing team of N.N. Light definitely found a perfect balance in how they wrote this book... from quotes across all walks of life (sports heroes, artists, motivational speakers, profits, philosophers, et al) to finding an interactive approach to applying the message to our every day lives. I even blogged about the concept of 'giving credit where credit is due' as that daily inspiration truly spoke to me. Another one was the concept of not needing to take credit for everything, as it's about the outcome, not who did it! What I found the most intriguing about this book was the daily message for my birthday -- a bit of irony thrown in as the focus was on finding your truth for that date. My blog is labeled 'This Is My Truth Now' -- I couldn't have asked for anything more nostalgic and introspective. So, the scoop... it's 365 messages, each kicked off by a quote (sometimes famous, sometimes unknown), followed by N. N. Light's interpretation and application to their lives. It's not pedantic -- in case that worries you -- sometimes these types of books can feel too preachy, but that's not the case here. It's humorous as the authors' personalities shine through in a way you want to get to know them more, especially as you learn about their lives and histories. A few entries were of course 'normal/typical' advice, but in at least 90% of the cases, between the quote and the inspiration content, I found myself keen to re-read the messages another time. I'd suggest skimming the book in the beginning, getting familiar with the style, then leaving it by your bedside to read when you wake up in the morning... a positive way to start your day. No actions, no moral lessons in the traditional sense. Just an opportunity for some fresh perspective that will push you to think about how you perceive everything around you. I'm glad I read this one and am pretty confident, if you're open to inspirational books (not religious or large-scale boring motivational speaker approaches) where a little bit goes a long way, you'll be quite intrigued and connected to these words. N. N. Light's Book of Daily Inspiration is inspiring indeed! It reads like a devotional, with thoughts for each day throughout the year-- a perfect way to start a day and get the mind on good, constructive, productive thoughts. The thoughts range from inspiring to encouraging, profound and logical... and everyone needs an encouraging boost, words to edify and uplift everyday. Life can be difficult and discouraging, and reading the passages helps to put the mind on the positive. I would recommend N. N. Light's Book of Daily Inspiration is inspiring indeed! It reads like a devotional, with thoughts for each day throughout the year-- a perfect way to start a day and get the mind on good, constructive, productive thoughts. The thoughts range from inspiring to encouraging, profound and logical... and everyone needs an encouraging boost, words to edify and uplift everyday. Life can be difficult and discouraging, and reading the passages helps to put the mind on the positive. I would recommend the book to everyone. It is a goldmine! I received this book from the author in exchange for an honest review. Thanks! A cross between a calendar and a book, this book is exactly what it says on the title: a daily dose of inspiration. It follows every day in a year of the author's life and provides some inspirational thoughts on what has transpired. As is usually the case with such works, I found some parts particularly relevant, as if she was addressing some of my own thoughts and fears (synchronicity at work, I guess). My preferred way of reading it was to glance at it when I got frustrated at something or oth A cross between a calendar and a book, this book is exactly what it says on the title: a daily dose of inspiration. It follows every day in a year of the author's life and provides some inspirational thoughts on what has transpired. As is usually the case with such works, I found some parts particularly relevant, as if she was addressing some of my own thoughts and fears (synchronicity at work, I guess). My preferred way of reading it was to glance at it when I got frustrated at something or other in my own life. This both let me unwind and helped me shift my perception, thus reducing my stress. This book is exactly what it says on the title: a book of daily inspiration. It follows the author’s life every day in a year with inspirational thoughts on what has transpired. It’s filled with quotations, short stories, and reflections. It’s a wonderful way to start your day or end your evening. I received the eBook version but I think I would prefer this type of book in print. I can see this book being used for many years over and over. “Don’t confuse your path with your destinatio This book is exactly what it says on the title: a book of daily inspiration. It follows the author’s life every day in a year with inspirational thoughts on what has transpired. It’s filled with quotations, short stories, and reflections. It’s a wonderful way to start your day or end your evening. I received the eBook version but I think I would prefer this type of book in print. I can see this book being used for many years over and over. Following creating a 2018 vision board, I began reading a copy of N.N. Light's Book of Daily Inspiration that I acquired through an awesome book promoter (Lola's Blog Tours). If you know me, I am not one for daily devotional type books. Honestly, the time each day tends to slip away from me and another concern is that I have been in somewhat of a fluctuating faith over the last few years. So any religious based enrichment has been iffy for me. I have read the da Following creating a 2018 vision board, I began reading a copy of N.N. Light's Book of Daily Inspiration that I acquired through an awesome book promoter (Lola's Blog Tours). If you know me, I am not one for daily devotional type books. Honestly, the time each day tends to slip away from me and another concern is that I have been in somewhat of a fluctuating faith over the last few years. So any religious based enrichment has been iffy for me. Warning: This is a very long review, more like an article, and is from a very Christian perspective. Read at your own risk. This is a day-by-day book of inspirational quotes and insights taken from this husband and wife team's blog, meant to give people encouragement and enlightenment. I have mixed feelings about this book. I loved the premise of it, and I have previously enjoyed N.N. Light's work, so I had good expectations. Unfortunately, I discovered several things about this book that I did n Warning: This is a very long review, more like an article, and is from a very Christian perspective. Read at your own risk. I have mixed feelings about this book. I loved the premise of it, and I have previously enjoyed N.N. Light's work, so I had good expectations. Unfortunately, I discovered several things about this book that I did not like or agree with. I don't like to say negative things about books, especially when they are written by such nice people, but for the sake of honesty I will. I felt that the book pushed the self-love idea way too much. Today the world is overloaded with selfish, self-centered people, and this constant praise makes it much worse. "You are a precious jewel", "be your own best friend", "you are a beautiful person", "love your flaws for they are a part of you and they are what makes you beautiful", "love yourself". This is really bad advice for people who are already too self-focused, which today is a LOT of people. Actually, it's bad advice for anybody. We all fall short of the glory of God. No man is perfect. We all have flaws. But if you embrace those flaws, then you won't work on fixing them. We need to strive for perfection, knowing that we will fall short, but also knowing that we tried. Meekness is listed among the fruit of the Spirit, and those are praised who have "humbleness of mind". Loving yourself, including your flaws, is the opposite of humble and meek. We would all do good to remember Galatians 6:3: "For if a man think himself to be something, when he is nothing, he deceiveth himself." It sounds harsh, but the truth often does. "Life is too short... you gotta have fun!" "Have the courage to follow your heart. Everything else is secondary." and "Have fun. Fall in love. Regret nothing, and don't let people bring you down." Having fun should not be nearly as important as faith, hope, and love. Following God should come before pleasing yourself, every time. Ecclesiastes 7:4 comes to mind: "The heart of the wise is in the house of mourning; but the heart of fools is in the house of mirth." But all of that aside, there were several positive things I liked about the book. I liked the positivity and optimism of the author. I liked the layout of the book very much, and how she started each day with an encouraging quote. I enjoyed many of the messages. And overall, I feel that Mrs. N is such a beautiful person because she encourages others to greatness! Three stars. Most of the time you can find them on Twitter or spending way too much time on Instagram. They’re a proud member of ASMSG and Independent Author Network. In addition to being authors, they’re also a top 300 Amazon reviewer and the owners of N. N. Light Author Promotions. They both love books, have ever since they were young. Matching up books and readers is something that gives them great pleasure.